Booth Park Birmingham Sledding – review, pics, and video. Located in Downtown Birmingham, Michigan, Booth Park boasts a fun playground and outdoor movies in the summer. 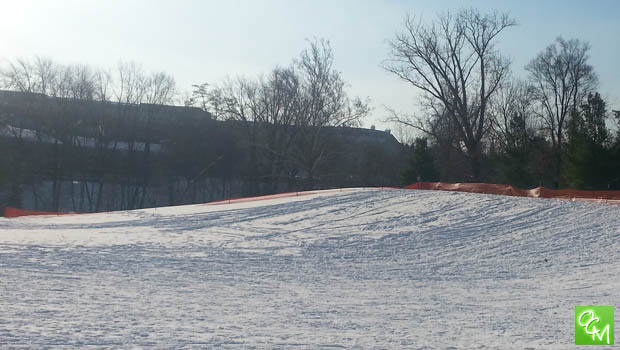 In the Winter, the playground becomes a decent-sized sled hill – especially for younger riders. You don’t have to travel to the far suburbs to find sled hills, Booth Park’s sledding hill is nicely suited for younger riders. Plus, it’s a neat experience to be able participate in winter fun in glorious Downtown Birmingham. The hill itself is perfect for young sledders as it’s quick and the walk isn’t too far or steep to get back to the top. The sled hill is fast enough to make it worth the drive to downtown Birmingham and it’s nice to know there are so many restaurants to warm up at after a few runs down the hill. Booth Park is easy to locate and parking is close to the hill – just remember to bring a couple of quarters for the meter. Sledding at Booth Park is “at your own risk” as it is unsupervised. Children must be accompanied by an adult. The hill is open during daylight hours only. If your kids are looking for more of a thrill – I recommend Lincoln Hills Golf Course for steeper hills, an indoor warming area, restrooms and an overall more intense sledding experience. Lincoln Hills GC is only 5 minutes away from Booth Park so you can try ’em both! See related posts below for more reviews and pics of Oakland County, Michigan sled hills, sledding videos and outdoor winter fun!